Author William Zinsser died at his Manhattan home on Tuesday, May 12, 2015. The 92-year-old left behind one of the classics of writing instruction manuals as his legacy, On Writing Well. Since its first printing in 1976, the book has sold 1.5 million copies, and Zinsser made sure to update the book often. He loved the revolution in writing that computers brought, calling it a miracle. Never have so many Americans written so profusely and with so few inhibitions. Which means that it wasn’t a cognitive problem after all. It was a cultural problem, rooted in that old bugaboo of American education: fear. Zinsser stressed simplicity and efficiency, but also style and enthusiasm. Here are 10 of his many tips for improving your writing. 5. And the more you keep in first person and true to yourself, the sooner you will find your style: “Sell yourself, and your subject will exert its own appeal. Believe in your own identity and your own opinions. Writing is an act of ego, and you might as well admit it. 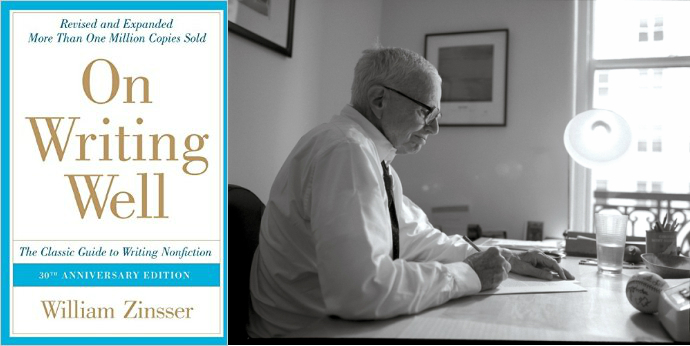 Zinsser follows his own advice, in that this book (pick up a copy here) is a joy to read, with a rollicking humor and an infectious enthusiasm. May he rest in peace! Drawing specifically from the experience of seeing my recently christened mother of a friend barely showing at 2 months then keep-your-overnight-bag-ready at 8.5 months, I’d argue that being “rather pregnant” is possible. And what to say of “unique”? Today’s viability of “rather unique” follows from a dilution of the meaning of “unique”. The word has been used so much that it has acquired gradations. Thanks for the great post. I’ve actually just hit a wall in my current writing project, and these points are refreshing. They’ve definitely inspired me to get back to it. I’ll be ordering Zinsser’s book as wel. May he rest in peace. I am sad to hear the William Zinsser has died. My copy of “On Writing Well” dates back more than two decades. I often re-read sections for inspiration and to experience once again the humor with which he delivers advice. I was a science writer and editor for three decades and often recommended “On Writing Well” (and Strunk and White’s “The Elements of Style”) to writers working for me. Both are classics that will never go out of style. This book provides the clarity, simplicity, brevity, and humanity that must be integrated into all business writing. I introduce this book to all of my graduate students.